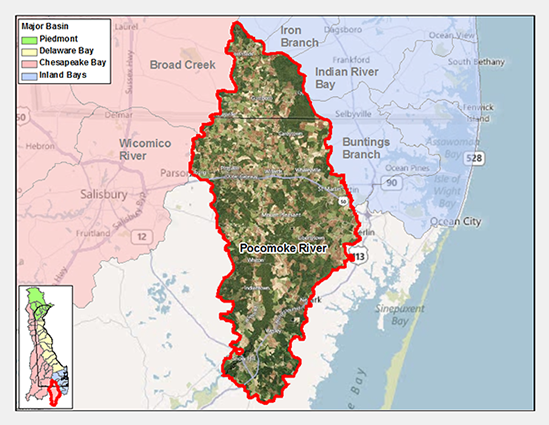 The Pocomoke River Watershed is comprised of roughly 16,000 acres in southern Sussex County. The 9-mile long main stem of the river in Delaware rises in southwest of Millsboro and flows south to the Maryland border. The river eventually discharges to the lower Chesapeake Bay. 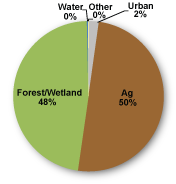 Land use within the watershed is dominated by agricultural uses and wetland areas. The headwaters and tributaries of the Pocomoke River encompass a portion of the area known as the Great Cypress Swamp. Much of the Pocomoke River and its tributaries have been greatly altered by wide and deeply cut dredge channels. As a result, the riparian floodplain community has been severely affected, with the wetland habitat of the floodplain swamp forests reduced to a remnant of its former self. Bald cypress remains only in sporadic stands in this watershed following the extensive 18th and 19th century logging, drainage, and subsequent wildfires that have greatly altered the hydrology and consequently, available habitat. Naturally occuring bald cypress are a rare species in Delaware. This tree species has a relatively limited distribution and is found in only four watersheds in the state including the Pocomoke River Watershed. There are no point sources in the watershed; therefore, all pollutants are generated from nonpoint sources within the watershed. The following designated uses are applied to the Pocomoke watershed: primary contact recreation, secondary contact recreation, fish, aquatic life and wildlife, agricultural water supply and industrial water supply. The TMDLs for the Pocomoke Watershed require a 55% reduction in nitrogen load, a 55% reduction in phosphorus load, and a 30% reduction in bacteria load. The Pocomoke River Watershed has two sites listed in the Site Investigation and Restoration Section database. The two sites are state-fund lead (HSCA) sites. If you would like to view reports for any of the sites in the SIRS program please follow the link the DNREC Environmental Navigator to search by map for the Pocomoke River Watershed. 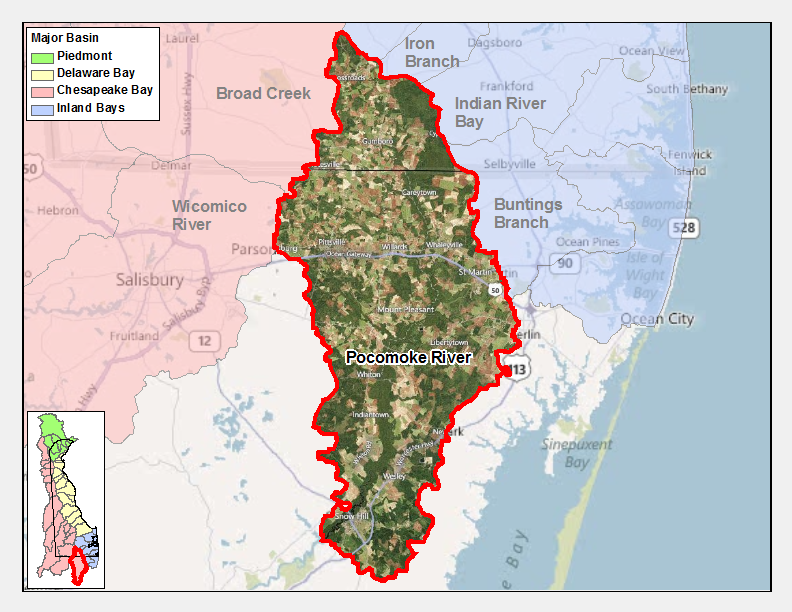 The United States Geological Survey describes the upper Pocomoke watershed by saying "Soils are generally moderately permeable but poorly drained and the water table is shallow. Ditches to promote drainage of agricultural fields are common."